Yesterday, as we walked down a lonely stretch of beach, Oksana and I were mugged by a heavily-muscled man with a machete. Our day started out well enough. After breakfast, we decided to follow up on an email we’d received from a dive center at one of the resorts. We checked a map and realized it was a walkable distance down the beach. To be sure, the owners of the lodge we were staying at warned us about a certain stretch of empty property where thieves had been known to hang out, but they assured us it was only dangerous for people with bags or cameras. Oksana tucked a few bills away in her swimsuit and I debated long and hard about the two things I wanted to bring: My iPhone and our GPS. The GPS because I wanted to record at least one good track duringour stay on the Eastern side of Zanzibar, the iPhone because we were going to pitch a work-trade deal with the dive center and can bring up our previous diving videos on it. I also carried my Swiss Army knife. I wouldn’t risk a fight over the iPhone itself, but I would for the data that’s on it. The walk to the resort was uneventful. 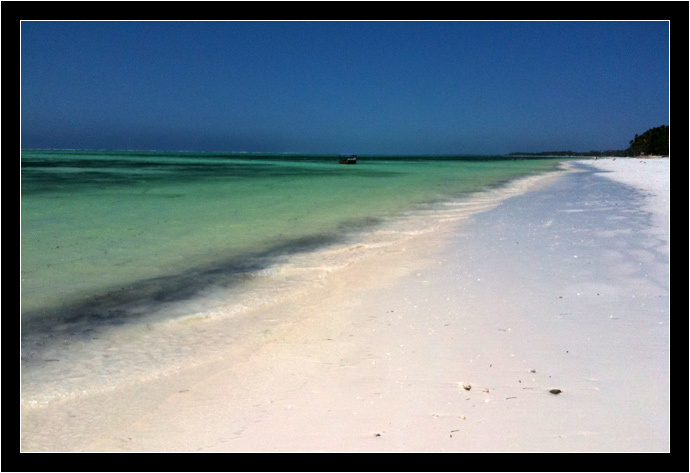 The bone-white, coral sand of Zanzibar is very soft, so the worst trouble we had was slogging through long, ankle-sucking sections of beach. We weren’t crazy about walking by the tree line, but eventually we had to, because the footing was more solid than the wet sand being lapped by small waves. We didn’t know exactly where the dangerous tree line lied, but when we came to a long expanse of eroded beach line where two or three palm trees had fallen and lay buried in the sand, we felt a sense of unease. Not only because it was a long, lonely stretch of beach, but also because we began to wonder if our map was wrong. We’d expected to come across the resort before then. I climbed up the eroded ledge of sand, looked into an empty field of palms just to check if there was something tucked back away from the beach. Aside from one crumbling structure with a thatched roof, nothing. We debated going back, but eventually decided to walk as far as the point. Good that we did; that’s where we found the resort. We met with the manager of the dive center and arranged a dive for the following Sunday. Before we left, we had a couple Diet Cokes beside the pool and gazed enviously at the people who could afford more luxurious accommodations. On the walk back, it was from that same stretch of land that I’d peered into that our assailant walked toward us. This time, we were walking along the waterline. The tide had retreated and the sand was better packed. Oksana and I were talking about our upcoming dive when a man, wearing only a pair of rolled up jeans, jumped down off the eroded ledge and came at us on an intercept course. “Uh-oh. Heads up,” I said, cutting Oksana off mid-sentence. My hands went into my pockets and I grasped my Swiss Army Knife. A black man approaching you on the beach isn’t an uncommon sight on Zanzibar. If you spend your day walking the beach, it’s likely to happen dozens of times. As self-proclaimed businessmen, they have dozens of pitches to separate you from your money. Want to rent a bike? Go snorkeling? How about a Spice Tour or a car-for-hire? They will promise you anything at all… unless all you want is to be left alone. In other countries, these “businessmen,” are called hustlers or touts. Here, they’re papaasi. It means “tick,” or “parasite,” or perhaps more colloquially, “blood-sucker.” If you so much as acknowledge their existence, they sidle up all smiles, trying to shake your hand and faking a personal relationship. The guy approaching us was not smiling. He angled in front of me and when he was about 5 meters away, he pulled his arm from behind his back. In his hand, pointed at the ground, was a very large and very rusty machete. It took all of one second for me to assess the situation and realize I wasn’t going to defend myself, and my wife, with a pocketknife. He was a few inches shorter than me, but heavily muscled. This was no desperate fisherman, trying to feed a starving family. It wasn’t even a guy who came upon his strength by hard labor in the fields. This was a man with a lot of idle time. And access to a large supply of anabolic steroids. With the machete at his side – always pointing to the sand, never at me – he positioned himself six inches from my nose and said, “You give me.” Later, Oksana wouldn’t be able to get over how unafraid he was, how bold. His eyes never left mine, never flicked across the beach to see if anyone was watching. His machete may not have been sharp, but he had honed his intimidation skills to a fine edge. “I have nothing for you.” My arms were up and out, palms toward him, to show I had nothing in them. I took a step to the side; he matched it. We had started the dance, but he wouldn’t let me lead. “Give me. Money.” His English was simple, heavily accented and hard to understand. His intentions were not. My mind was moving as fast as it ever has. What can I do? If his machete were up, I could risk an attempt to knock it out of his hand – If either Oksana or I got a hold of the giant knife first, this would all be over – but, no; he was holding it behind him. The ocean was right next to us; would he follow if we swam for it? Should I tell Oksana to run and hold him with me? And finally: What am I willing to give up in this situation? Oksana had already taken off her earrings, two cheap pieces of surgical steel she wears just to keep the holes open. She was waving them in our mugger’s face, “Here. You can take these. Take my earrings.” He didn’t even glance at her; his eyes were locked on mine. He took it and I deftly stepped around him. I was still facing him, but now we were walking down the beach again, only backwards. The money did not placate him. “No!” He tried to position himself to block our progress again, but we wouldn’t let him circle around. “No! Give me. Give me things!” He used the machete to point to the two pockets of my cargo pants, pendulously swinging with the weight of my iPhone in one, the GPS in the other. He was getting close again. His broad, flat nose was in my face. I studied his close-cropped hair, the stubble on his chin, and the rash of pimples across his face. I can identify this man, I thought. I stopped again before he tried to stop me. “I gave you money.” Now what am I going to do? That’s when Oksana started to scream. I never knew my wife had that in her! She took a deep breath, leaned forward from the waist, towards this hulking guy from Zanzibar, and screamed into his face. It was a flushing-birds-from-the-grass kind of scream. It was the kind of scream you see in the movies where they use rapid-fire cuts to change from the empty street, to the treetop view, to the entire countryside. It was a startling scream. The guy’s eyes left mine in a heartbeat and he took a few stumbling steps back. Oksana’s scream tapered off and she filled her lungs again. By the time her second scream was done, he was halfway to the tree line again, looking all the world like a whipped dog, eyes darting up and down the beach and back to us. Her third scream chased him up over the eroded sand wall and into the trees. I hope he hears the fourth in his dreams. We stood there and watched him run. Oksana wasn’t screaming for help, playing the role of a damsel in distress. She was the vengeful banshee, directing all her rage at the person who had shattered our sense of security in this pristine tropical paradise. We resumed our walk down the beach. We didn’t run – never panicked – even though there was still a fairly long section of empty beach ahead of us and the strong headwind, in all likelihood, carried her screams in the other direction. Throughout it all, we were both remained remarkably calm. I noticed that my heartbeat was, and always had been, slow and steady. No adrenaline flooding the system, not a hint of a flight or flight response. “So. How much money did we lose?” I asked her a few minutes later. As we walked, I smiled. As far as I was concerned, we couldn’t have handled the situation any better. We gave him a wad of money that he couldn’t count without taking his eyes off me. If we’d given him nothing before she’d screamed, he might have been tempted to fight for something, but for all he knew, there might have been a couple hundred U.S. dollars in that stack. Better, for him, to cut his losses and run. And I still had my iPhone, GPS, and Swiss Army Knife; not to mention an uninjured – if extremely pissed off – wife. Win-win-win-win. Ten minutes after the encounter, we spied two women riding bikes up the beach towards us. We flagged them down and told them what happened. They’d planned to ride to the “good section” of the beach, just past where we’d been mugged, and they had both their purses and cameras with them. They thanked us for the warning and promptly turned around. Back at our lodge, we sat down with the owners and told them what happened. I felt stupid because they told us about that spot when we checked in. We’d weighed the risks and decided to go anyway. They were completely without fault, but still felt guilty because they’d assumed we would be safe as long as we didn’t carry a bag or camera in plain view. Which makes us wonder: Why did that guy come out of the trees for us? Could he tell that my pockets were full from so far away? Did he see me take that one-and-only photo of the ocean (above), with my iPhone, half a mile down the beach? Was he just hoping that we might have some money on us? I guess we’ll never know. We told the owners of our lodge that we’d like to report the incident to the police… if they thought it would help. We both felt we could recognize our assailant and we both suspected that he probably works at one of the lodges or resorts on the beach. Losing fifteen dollars – after a year of travel! – is nothing to us, but it galls me to think that this guy will get away with taking it from us. “Well, yes…” they agreed the incident should certainly be reported, but it’s unlikely anything will happen. “Everyone on Zanzibar has a brother or a cousin or a friend…” She left the rest unsaid. “This is why we employ Masai warriors for our security. They have no ties – and want no ties – to the community.” Well, at least answered one question. I’d wondered about the rail-thin man in flowing red cloth who stalked the beach in front of our lodge every day with hand-made weapons on his belt. They told us the next morning that they did report it. To the police, to the nearby village, and to the owner’s association of beach properties. The chances of the guy being caught are slim to none of course, but perhaps renewed warnings will go out to the tourists, and perhaps travelers smarter than us will take them seriously. If you’re asking, we’re fine. 24 hours later, Oksana is still enraged, but she’ll get over it. I like to look on the bright side: We got this fantastic story for only 15 bucks and we have a new category for our budget: Muggings! This is the first time we’ve had anything taken from us at all. Nothing has disappeared from our bags, no pickpockets have run off with our wallets (though one tried in Peru! ), and we’ve been traveling for over a year. We’re beyond lucky to have only lost $15! We have four more days of beach time on Zanzibar before we move on, but our sense of security was taken with our 25,000 shillings. Realistically, we know that as long as we stay near our lodge, we should be fine. Even so, whenever a papaasi approaches us, our guard goes up. Last night, we dined at a restaurant down the beach and had to walk back to our room in the dark. Oksana’s head was on a swivel and I held my pocketknife – already open and unfolded this time – in my pocket. The owners of our lodge have assured us that the people of Zanzibar would never actually harm anyone (it goes against their nature), but it’s hard not to worry when you’ve been intimidated by the Incredible Hulk and his rusty machete. It’s sad, because Zanzibar is – or at least could be again – a beautiful place. The finest white sand I’ve ever seen, a wonderful ocean breeze, reefs for snorkeling and diving, fresh seafood every night, palm trees and hammocks and cheap cold drinks. Flip the coin over, though… Stonetown is an unattractive, working port crowded with poverty-stricken people, where the historical buildings are hidden behind ramshackle structures of no import. The Papaasi bother you wherever you go and the culture frowns upon western-style beach attire (which is perhaps why many in Zanzibar would be happy to see tourism end altogether.) And, of course, there’s the crime. I hope the Tanzania Tourist Board takes note: I would love to recommend you come and visit, but I’m starting to think Zanzibar’s ugliness and danger outweighs its beauty and storybook history. I left out the names of the lodges and resorts in this blog entry because I don’t want them to suffer any loss of business based on this blog entry. Truly, if you can resist the temptation to walk down the endless white-sand beaches and stick near your hotel, you’ll be fine in Zanzibar. If after reading this, you’d like a recommendation on where to stay (or where to avoid! ), I’d be happy to help via email. Wow! I am so glad that you got away safe and only lost $15. Perhaps it will turn out to be a good (and safe) reminder to not let your guard down. I’m not saying you have yet, but it can happen after so long without incident. Too bad you didn’t have the iphone in record mode, so you could have captured Oksana’s screams! BTW – your story writing was fantastic, I felt like I was reading a good book! It’s too bad that happened to you guys, but it does make an awesome story! You’re a fantastic writer, I fully expect there to be a book about your travels at some point. Thanks for the comments, everyone. The general consensus (here and in comments on Facebook) is that Oksana was the hero and my writing was engaging. I had a feeling it (the writing) was going well as I was typing this up, but I didn’t realize everyone else would like it as much as I did. For what it’s worth, every word is true and not even a little bit embellished; this was exactly the way it happened! I met you on the balcony at the lodge in Stone Town a couple of days after this happened, just found the little card you gave me telling me to keep in contact, sorry it’s taken so long! The rest of your trip looks fantastic, you are a great writer. Hi, Craig! Nice to hear from you and thanks for the compliment on the writing. Glad you got in touch, because I wanted to tell you that you were absolutely, 100% correct about Egypt. Not only about how aggressive the hustlers can be (hands down, our least favorite country we’ve traveled through, because of that), but also about booking a complete tour from Cairo-Aswan-Dahab with a Nile cruise in between. Thanks for that fantastic suggestion; it was easily the best part of our Egypt experience! When your travels are over Oksana has a new skill set for her resume: Bodyguard. Glad you are both safe and am amazed at your luck in avoiding really dangerous situations in your long travels — God is looking out for you. Hello there Arlo…. I read your story while googling for info on Zanzibar and I was gripped by your nasty experience. A scary tale, but you write well. So, we plan to visit just for a few days in February before going towards Kilimanjaro. There is clearly a lot of accommodation choice, but if as experienced (budget?) travellers you have any suggestions or tips of where to go or stay away from, I would most appreciate them. We are 2 couples with adventurous spirits. Trying to retrace our steps without my journal in front of me, I think we also really enjoyed our meals at the Archipelago Cafe in Stonetown. Great food. Anyway, that’s it off the top of my head. If you have more specific questions, I can try to answer them. Otherwise, I’ll just point you to the two online resources we used the most in our travels: Wikitravel.com and TripAdvisor.com. Good luck and have a safe trip!